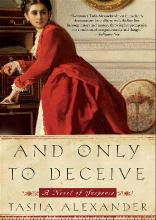 And Only To Deceive is Alexander's first book in the Lady Emily series. The series focuses on our heroine, Lady Emily Ashton, who is a young, rich widow living in Victorian England. She was married only a short time to a man she knew almost nothing about and had very little interest in changing that fact once she was married. She married only to escape her nightmare of a mother (think Mrs. Bennet on steroids with bit more public decorum). The book's main focus is following Emily on her journey to know, understand and truly mourn her stranger of a husband, Philip, while at the same time coming into her own as an independent woman. After coming out of full mourning and beginning to re-enter society, she finds the social strictures as confining as the blasted corsets and unpalatable as the sherry. As she learns more about her late husband she begins to take an interest in his passions. She begins to learn Greek, read Homer (Lord, deliver me from ever having to pick Homer up again), and develop an interest in Greek antiquities. Through this she finds that her husband had been caught up in a mystery which leads her to question his integrity. She, of course, along with her two friends simply must get to the bottom of things. I must admit that this part did get a bit Nancy Drew and her BFFs, George and Bess, for me but I could fight through it. Enter the love interests, Colin, her late husband's nearest and dearest and Andrew, another friend of Philip's. The reader is supposed to be far more swoony for Colin even though his unknown part in the mystery makes him seem a bit shady. I'll give him some swoon, but he's no Mr. Darcy or Captain Wentworth or even Brisbane if you read Deanna Raybourn. I have a feeling his swoon factor will improve in the next books. I liked this book very much. I enjoyed Tasha Alexander's voice and characters. Emily, who I did not care for much at the beginning of the book, grew on me as she continued to evolve and mature. She had her moments of knuckleheadedness but overall she was likable, and I cared about what happened to her. One of the strongest parts of the writing was the excerpts from Philip's journal. It really let the reader get to know him. It felt like we were sharing Emily's journey of discovery along with her. I look forward to reading the next book in the series. OH MY GOSH! This book was soooooooooooooooooooooooooo good. For those you not in the club of awesomeness known as the St. Cyr Society of Adoration or Team Hero....then you need to get on board! 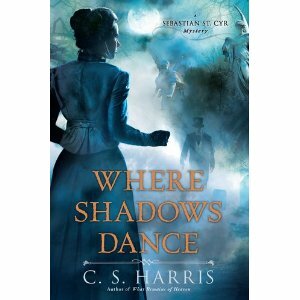 The St. Cyr mystery series is set in Regency England. The books follow the path of Sebastian St. Cyr, Viscount Devlin. A tortured and wounded soul that upon his return from the battlefields of Spain, begins solving murders in London. Due to his unique position as a one of the ton, he can go to and ask questions of those that otherwise would be protected from the insult of even being considered as a culprit for murder, much less investigated. This newest book follows the intrigue surrounding the death of Alexander Ross, a member of the Foreign Office. What is first believed to be a natural death is soon proved to be murder. Devlin is asked by his close friend, Dr. Paul Gibson, to investigate the murder. The trail leads Devlin all over London, into the spy networks maintained by France, Russia, and England, the office of the Foreign Office, and Devlin's archenemy Jarvis. The story is further enriched by the continuing drama between Devlin and Hero Jarvis. This latest book (the 6th in the series) was worth the almost 2 year wait...yes...it was torture for me because I'm a crazy fan like that. It's my favorite so far. My only complaint is that it was too short but that's my normal issue with books when I read them in a day; which was the case here. So if you like mysteries, Regency, troubled heroes, quirky characters, intrigue, and FANTASTIC writing then give these books a shot! I recommend that you start at the beginning of the series. Each one is WAY too good to miss!!! The first is a series of three books following the illegitimate offspring of a none too heroic naval officer, Marrying the Captain is the story of Eleanor Massie, also known as Nana. When her father decides to sell her to the highest bidder to pay his gambling debts, Nana runs from his influence and the school for girls he sent her to. Finding sanctuary with her grandmother in her hometown of Plymouth, she tries her hardest to keep the Mulberry, the boarding house she and her grandmother run, from closing down. Living in a navy town, Nana is reminded time and again of her mother's fall from grace and the circumstances of her birth and swears she will not be persuaded to meet the same end. Naval Captain Oliver Worthy is given what at first looks like an innocuous assignment by his commanding officer (Nana's father) to find her and keep an eye on her while he is in Plymouth. His ship, the Tireless, is in dry dock for repairs to damage done in a skirmish with the French. As part of the blockade of the French coast, Oliver cannot wait to get back to sea. And as a life-long navy man, he has seen too many comrades die in battle and leave families behind to grieve. He swears that he will never marry and put someone through the pain of waiting for him to come home. Well, you know what they say about good intentions. Oliver takes up residence at the Mulberry and predictably, he and Nana fall in love. What's not predictable are the obstacles thrown in their path; French spies, kidnapping and cowardly Admirals among them. The ending, when it comes, is a satisfying conclusion to a story whose outcome is not guaranteed. This is the first Carla Kelly book I've read, and it won't be the last. I have the two sequels on order, and look forward to re-visiting with Nana and Oliver in those. For a quick read, almost innocent in its story-telling and characterizations, Marrying the Captain is a sweet diversion. Shadow was never been one to believe or not believe. He lived a simple life with his wife Laura, but a series of unfortunate events had landed him in prison. An early release is the beginning of a road Shadow could not have imagined in his wildest dream of traveling. As circumstance would have it, Shadow joins up with Wednesday, formerly known as the All-father Odin. Their journey takes them across the United States, as Wednesday attempts to rally (or coerce) his fellow forgotten gods to join him in battle against the new gods of the wired age. During all of this, Shadow is plagued by dreams his doesn't understand, escapes numerous hit attempts by the opposition, mixed feelings about his wife, all the while trying to grasp the things he has seen and heard. As his journey comes to an end and as the battle for the Badlands wages, to see which side will survive in the land, Shadow finally understands what everything is about, what he is about, and reaches his true potential. 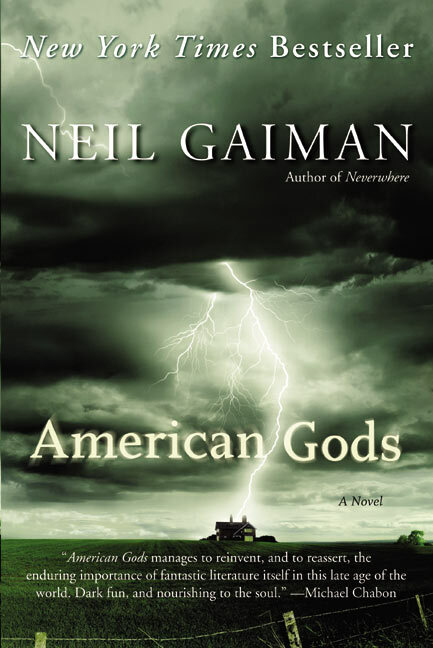 If you are willing to open your mind to the possibilities of what may really be, to see how our thoughts and beliefs can take shape and mold our world, then take the jump into another one of Neil Gaiman's edgy and amazingly fantastic novels.